Jewellery is considered to be a perfect gift to express your love and affection. It has also been used since ages to compliment beauty and status symbol. However, jewellery is not just about ornamenting yourself or status symbol; it has become a fashion and style statement now. History of jewellery dates back to many years. First signs of usage of jewellery were found in South Africa and are considered to be 75,000 years old. In Stone Age, man and women wore jewellery to adorn their body. Pre-historic humans used bones, animal teeth and sea-shell to construct their jewellery. They also used other natural objects for personal adornment. Jewellery has also been a mean to display stature or rank. Back then, there were no expensive cars and private jets to show off wealth, precious metals and stones gracefully bore this responsibility. Jewellery has also been associated with special occasions across cultures, for example, wedding rings ceremony has main event in which groom puts rings on the bride’s finger. Jewellery has gone through many experiments and creativity over time. People have used their imagination to make jewellery more beautiful and eye catching. Jewellery now goes in line with fashion and there is always a particular type trending in the market. However, there are some kinds of jewellery that can be called timeless. Personalized engraved fingerprint jewellery is one of such kinds. Fingerprint jewellery is often worn to symbolize special bond or relationship with someone special. A lot of work has been done on jewellery. From prehistoric to modern era, jewellery has been moulded into every possible imagination. Yet, newer trends keep emerging. In today’s technology prevalent digital era, we now have smart jewellery that can communicate with your phone. Smart jewellery comes embedded with sensors which can keep track of your activity and transfer this data to your smartphone. There are bracelets and rings that can convey notifications from your connected device. From prehistoric animal teeth and seashells, we now have jewellery made out of recycled plastic and even waste material. So jewellery has gone through every possible experiment it could. So why not fingerprint engraved jewellery? Some people just don’t want to go with what is available off-the-shelf and want their own customizations to display on the stuff they buy or gift. Personalized items give a special feeling, specially when they are gifted on special occasions. There are many options to personalize different items available in the market, like printed coffee mugs, clothes, caps, etc. When it comes to jewellery, treatment of personalization is given to it during the manufacturing process. Unlike most other personalized items, which have either text or photograph printed on the surface, personalized jewellery is engraved or cut into the shape with the text or graphic of your choice. This text or graphic can be your name, signature, favourite quote or pretty much anything you want, even your fingerprints! Wearing and gifting fingerprint engraved jewellery is an increasing trend. However, people choose fingerprint engraved jewellery not just for the sake of fashion or trend. There are profound meanings of having fingerprints engraved on jewellery. 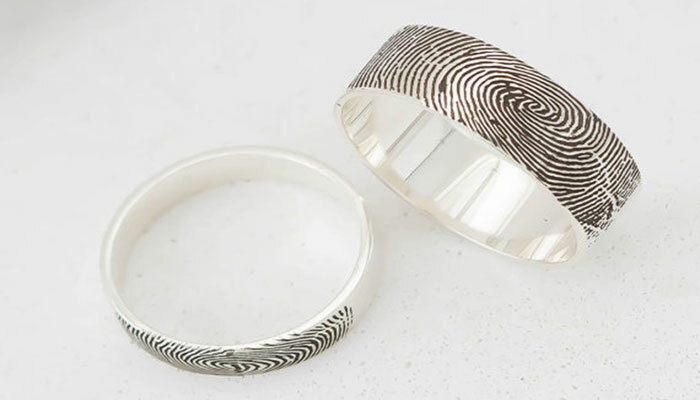 Fingerprint engraved jewellery is worn as a symbol of special bond or relationship. People capture fingerprint of their loved ones on jewellery or a keepsake to keep it with them all the time. Fingerprints do not explicitly tell about the owner of the fingerprint. It raises curiosity among friends and relatives. Out of curiosity, people often wish to know the story behind having fingerprints on your jewellery. It gives you a chance to express your special feelings about who you care. Parents have their kids’ fingerprints engraved on pendants, rings and bracelets. Couples also engrave each other’s fingerprints on jewellery to keep it with them all the time. That is not all; personalizing jewellery with engraved fingerprint is a beautiful way to preserve precious memories of someone. How fingerprints are engraved on jewellery? Manufacturing fingerprint engraved jewellery is just like manufacturing the same piece of jewellery without fingerprints. The difference is that it involves an additional process of engraving fingerprints provided by the customers. Rings, Bracelets, Pendants and Earrings are common jewellery items that are suitable for fingerprint engraving. To get fingerprint engraved on a piece of jewellery you need select the jewellery or keepsake and provide fingerprint that needs to be engraved on it. Fingerprints can be captured applying ink on thumb or finger and gently pressing it against a clean sheet of paper. When fingerprint quality is satisfactory, it can be provided to the jewellery manufacturer. Online stores also have facility to upload scanned image of customer fingerprints. Store’s designers then create an enhanced digital image out of provided one. They usually take the most distinct swirl pattern of customer fingerprint, to make it look interesting. After enhancing the image and selecting the fingerprint to engrave, a wax mold of the image is created by computer assisted manufacturing process. This wax mold is called Pattern. After producing the mold, desired piece of fingerprint jewellery is produced using last wax casting method. The pattern is then filled with plaster. It is left to set and the wax is removed when the plaster is set. The next step is to force the melted precious metal into the plaster with a centrifuge, creating jewellery with engraved fingerprint. The piece of jewellery is then cleaned up and finished by filing and polishing it. From prehistoric to modern era, jewellery never let its value deteriorate. It is still as relevant as it was in the past. Women have special affection with jewellery and wear it to complement their beauty. Now jewellery goes hand in hand with fashion. Combining Jewellery with technology has given birth to smart jewellery, which can communicate with your phone, keep track of your activities and serve notifications. Personalized engraved fingerprint jewellery in getting popularity among people who wish to symbolize the special bond they have with someone. People have been wearing and gifting personalized jewellery engraved with their name, handwriting, signature, or quote in the past but fingerprint engraved jewellery is an increasing tend now. Since fingerprint of a person is a unique feature, engraving it on jewellery or a keepsake makes it one of a kind. A special bond with someone is just like fingerprint, it never changes! And having it engraved on jewellery shows your commitment of keeping this bond intact.